Allegro School of Dance: Oakville Dance Lessons - Learn to Dance! For decades, professional dancers have been compared to athletes because of their strength and agility; but it has always been their artistry that separates them and makes them rise above the rest. At Allegro School of Dance, students are taught to execute each and every movement with the precision of an athlete and the individuality of an artist. Through positive reinforcement and continuous encouragement, Allegro’s students are able to reach their full potential as dancers, technicians and performers. 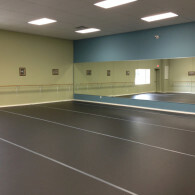 The studio is run by artistic director and principal teacher, Laura Dacyshyn. Once a professional ballet dancer, Laura has had the good fortune to train with the world’s top instructors, including those who worked with prodigies such as Karen Kain, Mikhail Baryshnikov and Gelsey Kirkland. Today, as a teacher and studio owner, she is uniquely qualified and honoured to pass on the same philosophies that inspired her lifelong passion for movement and dance. As a testament to her teaching success, many of Allegro’s students have been accepted into profesional programs at the National Ballet School, Royal Winnipeg and Quinte Ballet School, The Bolshoi Academy Summer Intensive and Ryerson University’s Theatre Program. Allegro Alumni are also currently dancing in renowned Canadian and European companies, including The National Ballet of Canada. For over 16 years, Allegro’s philosophy has supported the right balance of encouragement and qualified instruction so that every child can develop into a strong and expressive dancer. We welcome you to the Allegro School of Dance, a trusted community-driven academy where students shine as individuals and experience first-class training in a fun and rewarding, safe environment. Visit the studio today to see why Allegro is your perfect choice for Recreational and Competitive dance lessons in Oakville, offering Ballet, Pointe, Jazz, Hip Hop, Acro, Tap, Lyrical, Contemporary and Conditioning classes to dancers of all levels and ages! FALL CLASSES BEGIN ON MONDAY, SEPT. 10, 2018! Allegro School of Dance – Serving the Oakville Community for 16+ Years!